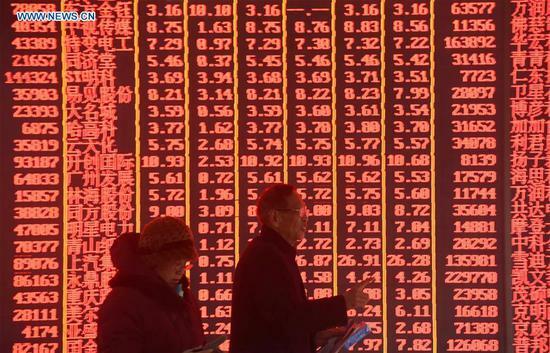 BEIJING, Feb. 11 (Xinhua) -- China's major stock indices ended notably higher Monday as investors greeted the Year of the Pig in China's lunar calendar with bullish sentiment. The benchmark Shanghai Composite Index closed 1.36 percent higher at 2,653.9 points while the Shenzhen Component Index surged by 3.06 percent to close at 7,919.05 points. Liquor makers saw a strong performance, with the share price of top liquor brand Kweichow Moutai jumping 4.71 percent, bringing the company's market capitalization to over 911 billion yuan (135 billion U.S. dollars). The ChiNext Index, China's NASDAQ-style board of growth enterprises, gained 3.53 percent to close at 1,316.1 points.